Situated just off from the Cathedral on Bennett's Hill in a former bank, The Lost & Found describes itself as British food in a quirky setting and this becomes very clear when you step inside. The setting is a library with botanical plants and had been perfectly decked out for Christmas. I wish I'd got a picture of the Christmas tree which gave me major Christmas tree envy. Cocktails and beers were ordered, a Tequila Mockingbird for Mum and a Sloe Gin Cobbler for myself. Then onto the food. For starters none of them actually appealed to me except the Smoked Mackerel and Horseradish Pate that my mum went for so I settled on some sourdough and olives which turned out to be a pretty good shout. The Pate was a hefty portion so I managed to get some for myself and can definitely recommend it. Meanwhile, my brother had the Sautéed mushrooms which I just managed to get a picture of before it was demolished. My dad had the Chorizo and black pudding sausage roll. The focus on my camera was really playing up - I think I need to take it in as it's been doing it a lot recently. For mains, it was a meaty affair with steak for the boys, a burger for mum and the duo of pork for myself. I enjoyed the pork but it wasn't the best I've ever had. 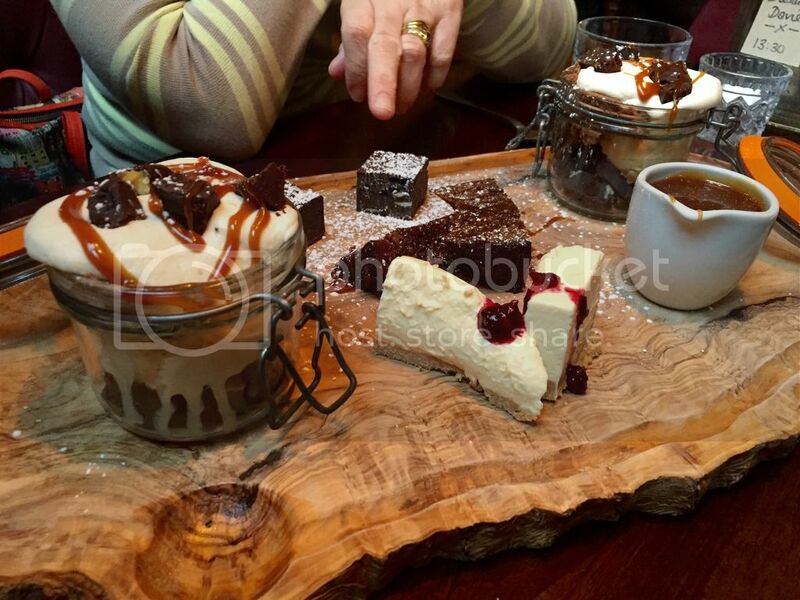 And then came dessert, we obviously chose the sharer with 4 spoons. 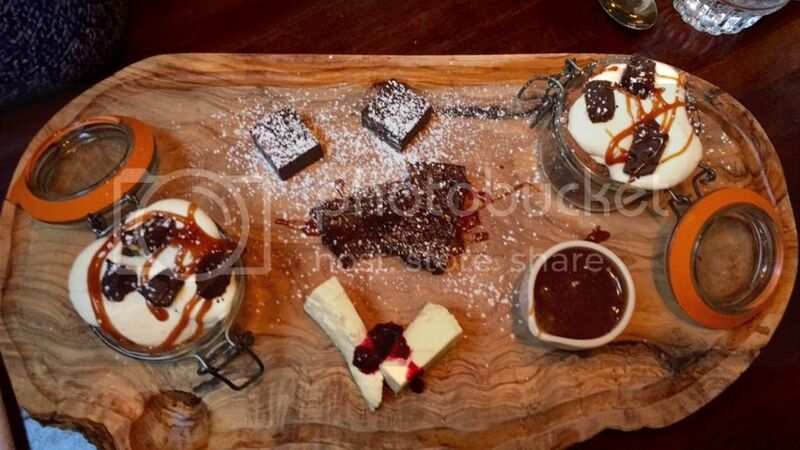 Mini gooey brownies, mini sticky date & toffee pudding, lemon curd cheesecake, mini chocolate mousse & salted caramel sundae. Let's just a close up of the sundae... these are not something I usually enjoy but the ice cream in this was delicious. I think the cheesecake was my favourite part though (obviously!) as it cut through the sweetness with the lemon. It was all very indulgent indeed. Unfortunately, the service was horrendously slow, I was starving by the time our food had arrived - this seems to be down to the way they order food from the kitchen, through tablets that all the staff carry round. The disappointing service was almost made up for by the food, although my mum remarked her burger was just that, nothing special. This is probably somewhere I'd head back to for drinks, it has that kind of atmosphere and they have quite an extensive menu that I'd like to work my way through. I'm also happy to announce they have a happy hour, making cocktails slightly kinder to the student pocket... not that I was paying this time.